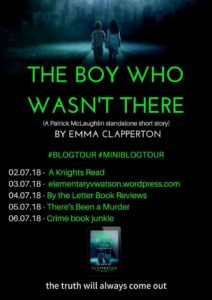 O-M-G 😱 I am more than excited to be taking part as the final stop in Emma Clapperton’s blog tour for The Boy Who Wasn’t There! This is a short story but linked to one of my favourite series with lead character Patrick McLaughlin. 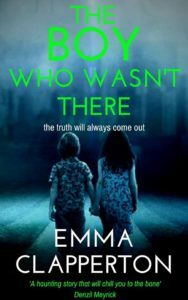 Massive thanks to Emma for the ARC and for asking me to take part in this #blogtour. Let’s find out a little more about Emma and this short story! But will he be able to help Lewis escape the dark corners of his psychic ability, or will Lewis become locked in the past forever? We’re back in Glasgow with the McLaughlin’s where loss, grief, fear, anger, substance misuse, consequences, addiction, selfishness, desperation, sadness, guilt, betrayal and jealousy are interwoven in a mysterious and haunting short story. Wow! What an opening! Emotive and intriguing, it certainly had me asking questions and wanting to know more! I loved the seamless move between the past and the present – allowing the story to unfold without confusing the reader. Told from the various third person POV’s, we are drip fed the clues to unravel this haunting mystery. The plot is tense, the characters are well developed – so even those who have never read this wonderful series could easily understand what was going on and the supernatural element just adds to the eery and unrelenting narrative. Death just seems to follow us no matter where we go, or what we do…. Poor Rita! Gripped by low self-esteem and depression, alcohol becomes her crutch to the detriment of her children. Rita’s story is very emotive – leaving me both wanting to shake some sense into her as well as giving her a hug and telling her it will be ok. 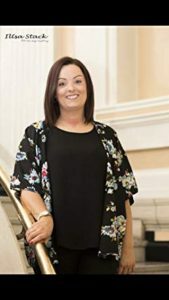 Her son, Tommy was also well written – having to become the “man of the house’ at such a young age but then making a decision that would ultimately lead to Rita’s downfall and horrendous consequences. I disliked both Maggie and Stewart (you’ll understand why when you read the book) and could completely get the bitterness that Rita felt towards these two. The lengths you will go to when you feel helpless, and depressed is an underlying theme within this short story and conveyed perfectly. 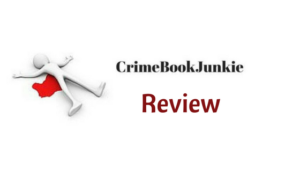 This entry was posted in Blog Tours, Book Reviews and tagged #BlogTour, #Crime #Twists #Murder, #CrimeFiction, #Emotive, #Series, #ShortStory, #Supernatural, #Suspense by crimebookjunkie. Bookmark the permalink.